Your dorm Christmas tree is about more than the ornaments you place on the branches. To really make your dorm Christmas tree stand out, you also need Christmas lights on the branches. You don't want to set up your dorm Christmas tree with no dorm room decorations on the branches and you also don't want to forget the dorm lights. Christmas lights have a way of making your college Christmas tree pop and look amazing. You'll notice a huge difference between your dorm Christmas tree with dorm lights and without dorm lights. However, maybe you want your dorm Christmas tree to stand out even more with one of a kind dorm lighting. 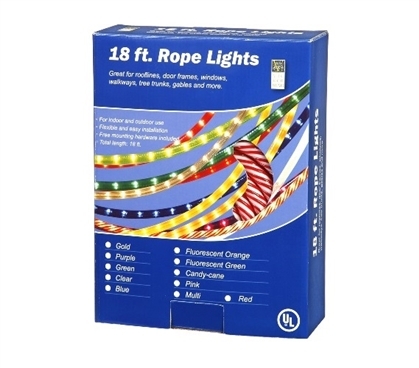 Our 18' Candy Cane Rope Light is the perfect dorm essentials item to make your dorm Christmas tree stand out. Featuring one inch bulb spacing and red and white striping on the rope, these dorm lights are perfect for the holiday season with their candy cane theme. Of course, you don't have to just use these college supplies on your dorm Christmas tree then pack them away for the rest of the year. These dorm necessities can also be used around your college dorm room! String these dorm items up around the perimeter of your college dorm room or make a cute design on the wall with our Candy Cane Rope Light for extra dorm wall art all year round!